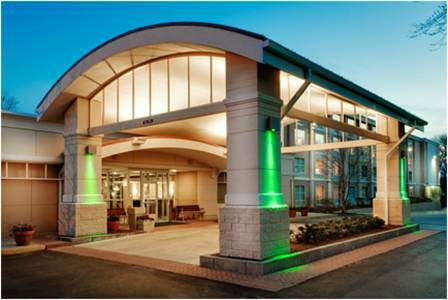 South Kingstown Hotel's New England Hospitality CharmsWelcome to the newly renovated and always-accommodating Holiday Inn South Kingstown (Newport Area) hotel. With ideal proximity to the University of Rhode Island and New England's finest beaches, this property is the perfect choice for travelers seeking quality and consistency in South Kingstown, RI. Major area corporations, such as Schneider Electric, Modine Manufacturing and Carousel Industries are within easy access from the hotel. The University of Rhode Island, URI in Kingston is just three miles from the hotel. Whether coming for a show at the Ryan Center, a baseball game at BIll Beck field, a conference at URI, or a training course at the University, the Holiday Inn is the perfect choice! In historic Newport, RI, are the spectacular Newport Mansions, world class dining and shopping options. The beautiful Narragansett beaches, fantastic museums, Nordic Lodge seafood buffet, antique shops and many dining options are all nearby. Minutes from the Holiday Inn, in Pt Judith you can hop a ferry to Block Island, which the Nature Conservancy calls one of the twelve "Last Great Places" in the Western hemisphere.Our hotel is near many wedding venues- the Towers, Kinney Bungalow and the Dunes Club in Narragansett, a hotel with a great location and unparalleled guest service. Look no further! "Stay Real" and call us today. George's of Galilee: The finest seafood and casual dining in the area. Located adjacent to Salty Brine Beach, outdoor fire pit. Easy access and parking. Hilltop Bar Lounge: Bar lounge is now open and serving your finest beverage. Renovations have been completed and ready to serve our guests. Come in relax and unwind with your favorite beverage. The Mews Tavern: One of many local favorites for beer and pizza. Loud, friendly environment. URI students, business people and locals love it. Childrens's program - The spacious outdoor pool provides lounge chairs and umbrella covered tables for relaxation and an afternoon of swimming. Please note that we do not provide a lifeguard on premises. Narragansett Room: Large banquet room with bright light and floor to ceiling windows along one wall overlooking our pool and patio area.. Full food and beverage services available through ur our Restaurant/Catering department..
South County CommonsA quaint shopping village located just 2 miles from the hotel and includes A Royal Tan, Of Corsets Lingerie, Spa Mosaic, Occhi Belli Eyewear, & a Psychic Kitty Holistic Pet Shop just to name a few. Pier Market PlaceGreat shopping located right across from Narragansett Beach! You can find shops rangiing from childrens & womens clothing to beach attire and souveniers! Wickford VillageWickford Village is a historic waterfront shopping area filled with quaint clothing & jewelery stores along with restaurants and cafes located approximately 15 miles North of the hotel. There are lots of eateries along the wharf too! Amtrak - Kingston StationAmtrak station - West Kingston. Train station is approx. 5 miles West of the Holiday Inn. University of Rhode Island (URI)The main campus of the University of Rhode Island is located 3 miles West of the Holiday Inn in Kingston VIllage. The Bay Campus is located 2 miles East of the Holiday Inn, South Kingstown. Beautiful Beaches - NarragansettThere is no place like the beach, and we're lucky to have the very best beach in RI - Narragansett Beach located just 5 miles from the Holiday Inn. Additional soft sandy beaches with great waves, great surfing, kayaking, and fishing are also nearby. Wedding Venues -The Towers, Kinney BungalowSo many great choices to have your wedding reception! Casey FarmBring your kids to visit a real live farm at Casey Farm, a 300-acre outdoor production facility. A historic element will beguile and charm visitors, as this farm can claim a rare status as one of the original farms of the Colonial era. Frosty Drew ObservatoryHands on Observatory to observe the wonders of the cosmos! Providence Children's MuseumThe museum caters to children an dhouses a multitude of exhibits such as time-travelling simulation, a dental show, and a children's garden! McCoy StadiumHome of the Red Sox's AAA team in the International League! If you're lucky, you may even see a Red Sox major leaguer! !